For human rights proponents, last weekend’s double veto by Russia and China of the latest U.N. Security Council resolution on Syria marked a sharp political defeat. But it also signaled a potent moral victory: That Russia and China stood alone, deserted by Azerbaijan and Pakistan, as well as India and South Africa, marked a tectonic shift. This sea-change, while too late to save the over 5,000 Syrians who have already lost their lives, may be the force that pries away Assad’s last vestiges of support and ends his onslaught on the Syrian people. U.N. human rights mechanisms have long been paralyzed by a polarized alignment that cast what then-U.N. Secretary General Kofi Annan described in 1995 as “a shadow on the reputation of the U.N. System.” For decades, many U.N. human rights debates have split down a well-worn middle, with Europe, the United States, Australia, Canada, Japan and a handful of others frequently siding against a large block of Asian, African, and Middle Eastern nations that aligned with China and Russia. This all began to turn on its head a year ago, accelerated by the unfolding crises in Libya and Syria. Until that moment, U.N. human rights resolutions targeting Middle East countries besides Israel were rare if non-existent. Though hardly the only ones to be shielded from scrutiny, Arab countries that perpetrated serious human rights abuses enjoyed a ring of protection; the support began with their neighbors in the region and spread throughout the developing world, anchored by solid Chinese and Russian backing. Yet last February, within days of General Muammar Qaddafi’s vow to hunt down his people like rats, the U.N.’s Rights Council passed a sweeping consensus resolution condemning the onslaught, booting Libya off the Council and launching an International Commission of Inquiry. Hillary Clinton and a raft of other foreign ministers descended on U.N. headquarters in Geneva for rounds of high-stakes diplomacy to contain the crisis. In a move virtually no one thought possible even a week earlier, the Security Council in New York followed suit the next day with an even more powerful resolution referring Qaddafi to the International Criminal Court. Notably, even Washington departed from its historic antipathy toward the Court in order to back the text. Having watched the fractious and dysfunctional 47-member Human Rights Council reach unanimity on Libya, the more visible and authoritative Security Council couldn’t but do the same. After setting in motion intensive international engagement on Libya, the Human Rights Council turned to Syria in April of last year, convening an emergency session as Assad’s assault intensified. The Council was initially split, with just 26 of 47 members supporting the April action, Russia and China staunchly opposed, and all Arab members abstaining or absent. But as human rights conditions in Syria worsened and Assad’s intransigence deepened, positions shifted. By the time the Human Rights Council held its third emergency session on Syria last December, Russia and China were joined in their “no” votes by only two countries: Cuba and Ecuador. While these resolutions obviously fell short of stopping the killing, they helped to build international consensus against the behavior of the Assad regime, kept Syria in the global spotlight despite an almost total press blackout, and allowed credible documentation of Assad’s grave abuses, paving the way for future criminal trials. They also helped inject human rights more deeply into Security Council deliberations in New York. In the last year, the U.N. High Commissioner for human rights went from briefing the Security Council barely once a year, to making six such visits in a 10-month timeframe. The number of references to human rights in Security Council resolutions increased by half. Even so, as debate intensified over the last week in New York, with hopes that a draft resolution had been watered down sufficiently to win Russian backing, insiders assumed that Pakistan, India and others would stand by Russia and China, no matter where they came out. In the end, though, reports of intensified heavy weaponry assaults and the weight of unified Arab League opinion favoring action held sway. By deciding to stand with the Syrian people, these governments have isolated Russia and China, training an uneasy spotlight on what may be behind the vetoes. Their lone stance underscores that even those most staunchly resistant to international human rights resolutions now think Assad has moved beyond the pale. It can be lost on no one that they day the veto was cast, Moscow saw its third set of mass street protests in a month. Russian intelligence officials echoed earlier assertions by Assad that the protests were orchestrated by intervening foreigners. 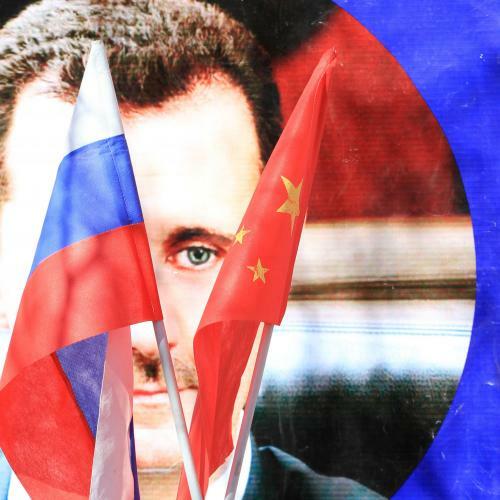 The bell of international condemnation and isolation tolling now for Damascus sounds an uneasy note in Beijing and Moscow. With the tide of international opinion now so solidly against the regime, though, Russian support for the Syrian regime (backed by China) becomes a finger in the dike. If Russia bends, Assad’s rein of terror will break. Without arms, funds or friends, a shift of course seems unavoidable. The next phase of international engagement on Syria must include a determined effort to keep solid the coalition that voted for last Saturday’s resolution. The horrifying reports and photos emerging from Syria in the days since the U.N. vote should help deter wavering. Moscow and Beijing must be subject to a relentless campaign of shaming, not only from Western governments and media, but from Pretoria, Delhi, Islamabad, Brasilia and other capitals that have come out on the side of principle. Amnesty International and other organizations will maintain an intense barrage of letters, emails, press releases and tweets from people all over the world who stand with the Syrians and against Assad’s violence. Other Arab governments should talk about how they gradually concluded that closing ranks behind violent dictators wasn’t the best strategy to keep protesters back home at bay, and about what steps they may take next to address the demands of freedom-seekers. Further efforts at the Human Rights Council, General Assembly and Security Council should be mounted to underscore Chinese and Russian isolation. Russia and China’s readiness to stand alone last weekend smacks of fear. While they claim their apprehension is for Syrian sovereignty, their abandonment by the rest of the sovereignty-first camp points to something deeper, relating to the advancement of human rights through new means and in new places. In the Syrian crisis, they may see something of themselves. But rather than shoring up their strength, their lonely vetoes signify the power of the rights being demanded on the streets of Damascus and Homs. The clearer this becomes, the better the odds of a swift resolution that vindicates the rights, and the hopes, of the people of Syria. Suzanne Nossel is executive director of Amnesty International USA. She is the former Deputy Assistant Secretary of State for International Organizations.